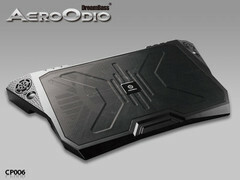 Enermax published detailed information on a new series of cooling pads for laptops. 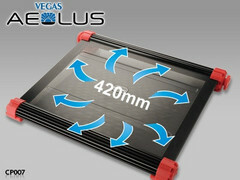 The products included are Aeolus Vegas, Aeolus Pure and AeroOdio. In the summertime, laptops seem to get fried more than usual, so Enermax chose the perfect time to announce three new products that will cool your notebook. At the same time, these Enermax accessories can also deliver various additional features that will surely make your life easier. While all three laptop cooling pads announced by Enermax come with four rubber feet and generous fans, supporting notebook sizes up to 17", their features vary a lot, as we can see by taking a quick look at each of them. First, we have the Aeolus Pure - made of brushed aluminum and featuring a full size wrist rest, this laptop cooling pad provides additional USB connectivity and its 9.8" fan offers 2-step speed control. Next in line is the AeroOdio, a notebook cooler that integrates two speakers and a DreamBass® sound chip, offering smart cable management and a 8.7" fan with manual speed control. 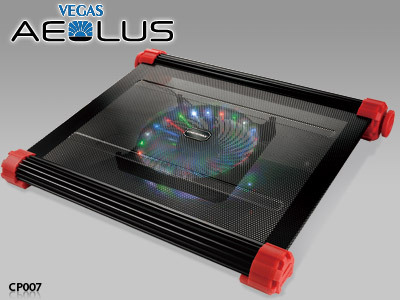 At last, there's the Aeolus Vegas, built by combining a steel mesh with aluminum fins and a movable 4-color Vegas LED fan that measures 7.1" and offers different lighting modes - Sparkle, All-on, Flash and Off. The Vegas laptop cooling pad also features a connector with USB extension and stylish rubber edges that allow for easy cable management, next to their obvious purpose - to keep the notebook stand in place. 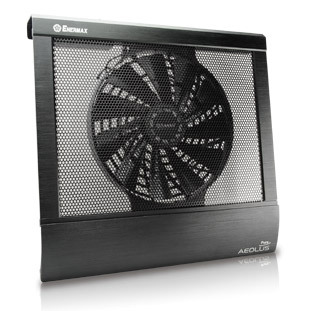 Unfortunately, Enermax have not announced pricing and availability yet, but these cooling pads should be available soon.